I love baskets of all kinds. Filling them each year for the school raffle was one of my favorite parts of being a room mom. The second was finding the perfect basket to hold all the goodies we had gathered to add to our class basket. Choosing a fabulous basket was not just about the raffle items inside. My co-room parent and I always tried to find something beautiful that the raffle winner could use in their home. We also tried to find something nice enough to “GASP” regift if they chose to do so. In other words, room parents are always on the search for the perfect raffle and decorating baskets. I am sharing some gorgeous gift baskets today! These are meant to inspire you to find great baskets locally or even to purchase online. 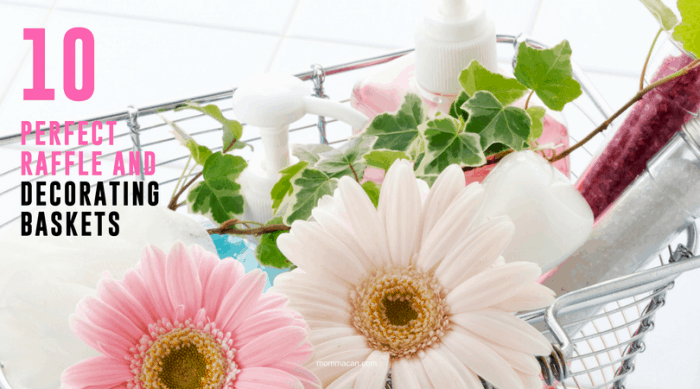 I love purchasing baskets online because it is a huge time saver for us busy folks! Please note: When choosing a basket for raffles and gifs make sure to take measurements of your heaving item. This item is usually the largest and it will need to fit neatly inside the basket with room for a bit of filler. Seagrass is a natural material and these super cute belly baskets are adorable. Grab yours here. If you love color try the Seagrass Belly Basket in this fabulous in aquamarine. This is a wonderful color for nurseries and casual coastal styles. Buy it here. Choosing a storage item for gifting is simple with this burlap toys organizer basket. Fill this with games, toys, and even a costume or two for fun! Find it here. I am crushing on this basket! It is so versatile and the perfect sweet addition to a large coffee table for visual interest. I can picture this filled with sweet toys for little hands to pick up and enjoy! I will always be the kind of mom and grandma that allows access to living spaces. This basket is made from handwoven new and recycled grass. Find it here. This is a shallow bushel basket. I think these are the best affordable addition to fall decor! If you are shopping for the school raffle basket this one is a great bargain and won’t break the budget! When I see bushel baskets it reminds me of apple picking in the fall, good times. Find it here on Amazon or at your local craft and hobby store during Fall. The basket is named for Jack, a young man who cares for his family’s backyard flock of 24+ egg-laying chickens. While we sell it as an egg collecting basket, its uses are endless and is the perfect vessel for a Farm House Theme decor gift basket! Grab your gorgeous chicken wire basket here. This basket is a wonderful size for blankets and toys as well as fluffy bath towels! This makes it an ideal size for bulkier raffle baskets, which is a real help for longer raffle items. Grab it here. This is the perfect gift basket for a baby shower and can be used in many baby nurseries for soft blankets and huggable bears. This also comes in a beautiful grey. Buy one for your next baby shower here. 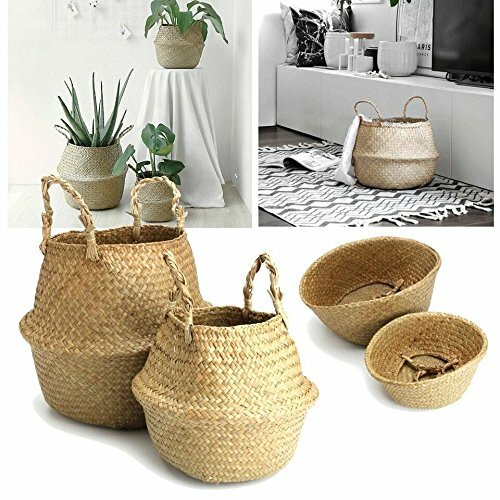 The hand-woven water hyacinth baskets are perfect for well, laundry. They also make a wonderful school raffle basket because they are super roomy and gorgeous. This basket comes in espresso and natural. Find it here. What is not to love about a basket that collapses to create and whole new kind of basket. The recipient of the basket in the collapsed form is going to be amazed to transform their gift into a loverly belly basket. So darn cute. You might want one for your home and you can find it here. I am just amazed at the wonderful selections for gift baskets and decorative baskets on Amazon. Before you leave be sure to check out my Freebie! 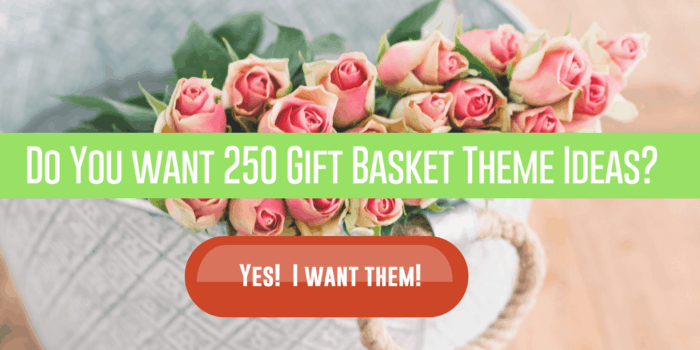 250 Raffle/Gift Basket Ideas. This is a freebie worth over $20 and is a really simple way to get gift ideas for your next raffle or event.